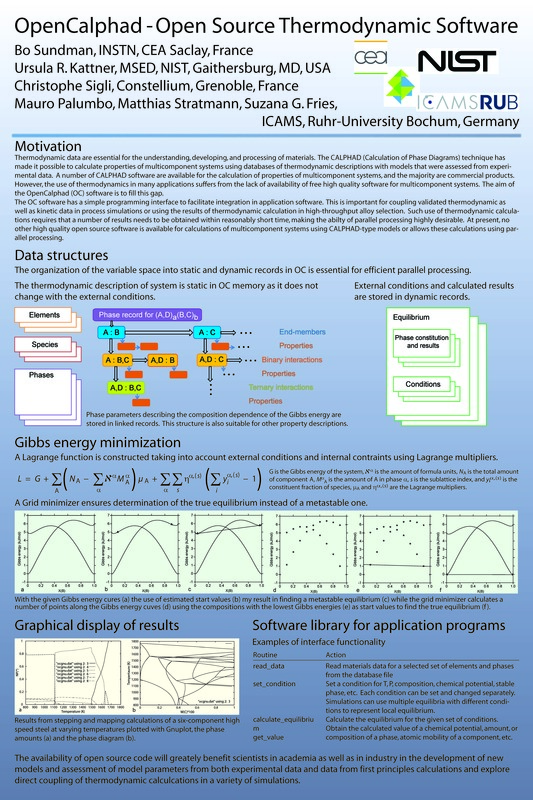 OpenCalphad (OC) is an informal international collaboration of scientists and researchers interested in the development of high quality software and databases for thermodynamic calculations using the CALPHAD (CALculation of PHAse Diagrams) method.The OC project was initiated by Suzana G. Fries as part of the Sapiens project at ICAMS (International Center for Advanced Materials Simulations) at Ruhr University, Bochum, Germany. The initial version of the software for was developed by Bo Sundman, Ursula Kattner and Mauro Palumbo. Thermodynamic data are essential for the understanding, developing, and processing of materials. The CALPHAD technique has made it possible to calculate properties of multicomponent systems using databases of thermodynamic descriptions with models that were assessed from experimental data. The OC software has a simple programming interface to facilitate integration in application software. This is important for coupling validated thermodynamic as well as kinetic data in such simulations for obtaining realistic results. Full Fortran/C++ application software interface, OCASI, using isoC binding. The first article written on OC describes the general concept of the software and details on parallelization and OCASI are presented in a second article. An initial version of an assessment facility to determine model parameters is being implemented using free optimizing subroutines LMDIF from the MINPACK software developed at Argonne National Laboratory. Work continues on the implementation of more commands and subcommands.